The daimyo (大名, daimyō) were powerful feudal rulers from the tenth century to the nineteenth century in Japan. Like feudal Europe, Japan was divided into a number of autonomous territories controlled by feudal lords, with the support of samurai. The ruling families were referred to as Daimyo, meaning great (dai, “large”) name (myo, for myoden, or “name-land,” meaning “private land”). From the shugo of the Muromachi period through the Sengoku period to the daimyo of the Edo period, the significance of the rank of daimyo went through various changes. The term "daimyo" is also sometimes used to refer to the leading figures of such clans, also called "lord." It was usually, though not exclusively, from among these warlords that a shogun arose or a regent was chosen. Daimyo held large domains with the assistance of samurai retainers, who were rewarded for their loyalty with grants of land or with stipends. In the late 1880s, the Meiji administration reorganized the few hundred domains of the Daimyo into prefectures. 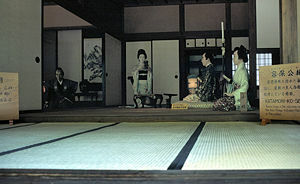 Daimyo Matsudaira Katamori visits the residence of a retainer. Mannequins in building in Aizuwakamatsu, Fukushima. By the twelfth century, some of the daimyo were more powerful than the emperor himself. In 1192, Minamoto Yoritomo established military dominance and became the first shogun. He and his successors awarded their followers with administrative rights (shiki) over noble estates, making them into daimyo. During the fourteenth and fifteenth centuries, the Ashikaga shoguns appointed shugo daimyo, military governors who had legal jurisdiction over areas as large as provinces, but owned relatively small amounts of private land. To supplement their revenues, the shugo daimyo levied taxes on the cultivated lands owned by nobles and religious establishments. During the second half of the fifteenth century, the shugo daimyo were supplanted by the daimyo of the Sengoku, or “Warring States” period, military lords who held small but consolidated domains in which they owned all the land, or distributed it among their vassals. By the late fifteenth century, as the Sengoku daimyo competed among themselves for the control of more lands, Japan was divided into many small, belligerent states. The Sengoku daimyo built fortified castles from which they controlled their vassals, who likewise were petty landowners with castles. Through almost a century of civil strife, the more powerful daimyo gained control over larger and larger areas, either by forming alliances or by defeating neighboring daimyo in battle. In 1568, Oda Nobunaga began a decisive military conquest of the daimyo that was later carried on by Toyotomi Hideyoshi and completed in 1603 by Tokugawa Ieyasu. The daimyo usually wore shades of purple, ranging from dark to light depending on their rank. Dark and light purple preceded dark and light green, dark and light red, and finally black. The very highest daimyo were considered to be nobles. After the Battle of Sekigahara in the year 1603 that marked the beginning of the Edo period, shogun Tokugawa Ieyasu reorganized roughly 200 daimyo and their territories, formerly provinces (kuni), into the han, and ranked them based on their production of rice. Daimyo were those who headed han assessed at 10,000 koku (50,000 bushels or 1,510,000 liters; one koku of rice is enough to feed one person for one year) or more. Ieyasu created three categories of daimyo, shinpan, fudai, and tozama, according to their relationship with the ruling Tokugawa family. The shinpan were direct kinsmen of Ieyasu, such as the Matsudaira clan, or descendants of Ieyasu outside the main line of succession. Several shinpan, including the Tokugawa of Owari Province (Nagoya, Aichi), Kii Province (Wakayama prefecture) and Mito, Ibaraki, as well as the Matsudaira of Fukui and Aizu, held large han. The fudai daimyo were hereditary vassals of the Tokugawa or allies in the Battle of Sekigahara. A few fudai daimyo, such as the Ii clan of Hikone, Shiga, held large han, but many holdings were small. The shogunate placed many fudai at strategic locations to guard the trade routes and the approaches to Edo. Also, many fudai daimyo took positions in the Edo shogunate, some rising to the position of rōjū. The fact that fudai daimyo could hold government positions while tozama, in general, could not was a main difference between the two. Tozama daimyo held large fiefs, with the Kaga han of Ishikawa Prefecture, headed by the Maeda clan, assessed at 1,000,000 koku. Other famous tozama clans included the Mori clan of Chōshū, the Shimazu clan of Satsuma, the Date clan of Sendai, Miyagi, the Uesugi clan of Yonezawa, and the Hachisuka clan of Awa Province (Tokushima). 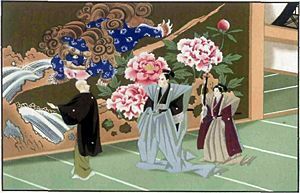 Initially, the Tokugawa regarded them as potentially rebellious, but for most of the Edo period, marriages between the Tokugawa and the tozama, as well as policies such as sankin kotai, resulted in peaceful relations. By 1800, there were approximately one hundred-and-seventy daimyo in Japan. The kinsei (early modern) daimyo of the Tokugawa period ruled over the three-quarters of Japan that was not held as grain-producing land by the Tokugawa bakufu itself, in a system called bakuhan. The daimyo swore an oath of loyalty to the shogun and received grants of land under his vermilion seal. The daimyo usually held 30 percent to 40 percent of the grain-producing land and allocated the rest to their retainers. Samurai no longer occupied their own castles but came to live in the daimyo’s castle, where they received a stipend. A daimyo administered his domain with the help of a group of retainers (kashindan). A Council of Elders (karo) was responsible for making policy and overseeing other officials, such as the heads of military units, superintendents of towns, rural administrators, finance, education and public works. A daimyo could issue his own currency with the approval of the shogunate. By the end of the Tokugawa shogunate, the daimyo functioned mostly as figureheads in their domains. Sankin kōtai ("alternate attendance") was the system developed by the Tokugawa shogunate to maintain political control of the daimyo and to prevent them from amassing too much wealth. All daimyo were obliged to spend every other year at the Tokugawa court in Edo, and to maintain their family members in Edo when they returned to their han. The expense of traveling to and from the capital every year with a large entourage absorbed any excess wealth, and created a thriving economy in the towns along the route. As time went on in the Tokugawa period, other means of controlling the daimyo were put into place, including mandatory contributions to public works such as road building. The daimyo were forbidden to build ships and castles, and other shows of military power were often tightly controlled. Dissatisfaction with these controls, and the economic hardships incurred by sankin kotai, and the forced support of public works, moved several daimyo to side against the Tokugawa shogunate during the Meiji Restoration. In 1869, the year after the Meiji Restoration, the daimyo, together with the kuge, formed a new aristocracy, the kazoku. In 1871, the han system was abolished and prefectures were established, thus effectively ending the daimyo era in Japan. The Tokugawa Shogunate created the Buke-Shohatto, thirteen articles of law which the daimyo were required to follow. These articles placed restrictions on such matters as castle renovations, the repair of roads, and marriage. The first two articles ordered the samurai to devote themselves to literature and arms and to refrain from debauchery. Articles 3-5 described the way in which daimyo were expected to govern their fiefs. Articles 6-8 prohibited conspiracies or other activities by the daimyo against the shogunate. Articles 9-11 dictated the clothing to be worn by each class, the vehicles that each could use, and the manners appropriate to each class. The last two articles, 12-13, directed the samurai to live in a frugal manner, and mandated that retainers be promoted on the basis of merit. The daimyo were allowed to exercise absolute power within their domains, but they were expected to up hold the policies of the central government. The laws of the shogun controlled all areas of national interest and protected the security of the shogunate. A daimyo could be removed from his position if he displeased the shogunate in some way. Between 1467 and 1614, when Tokugawa unified Japan, many battles were fought between the daimyo of different states (kuni). During the battles, flags and banners were used to identify the forces of each daimyo, so that warriors would be able to recognize their allies. Vertical banners called nobori-hata, approximately 4 m x 0.7 m, were placed in the center of camp. Square flags called uma-jirushi (“uma”-horse; “jirushi”-mark, or sign) 2 m x 2 m, were used to display a general’s rank in battle. The flags bore the family crests (mon) of the daimyo, and often brothers and cousins within the same family had their own flags. Inside the castle, flags were not used but each samurai on duty wore ceremonial kimono, called kamishimo, with his family crest (mon) showing in three places. The God of War was believed to reside in the daimyo flags, and when not in use they were place in a valuable box and stored in a special room of the castle. After 1614, the flags were no longer needed, except for ceremonial occasions, because battles were no longer being fought. Flags from this period are often rectangles displaying a simple symbol. This page was last modified on 25 July 2013, at 14:38.